a.k.a the infrequently asked questions page :-) - a lighthearted stroll through some Edinburgh history and landmarks. Edinburgh - the ancient capital of Scotland? Well, not that ancient - it was originally the northernmost city of England. Over the centuries, Scotland has repeatedly tried to nick bits of England - usually with dismal lack of success. However a thousand years ago we had the rare advantage of a (usurper) king of England known to history as "Aethelred the unready". He was no more ready to deal with invading Scots that with any of the other troubles that beset his unhappy reign. What exactly the English-speaking inhabitants of Edinburgh and surrounding regions thought when gaelic-speaking, kilt-wearing, broadsword-wielding clansmen overran them is not recorded - this period is called the dark ages for a reason. But, as I can testify, having grown up in Edinburgh, the local inhabitants have since adjusted really well to the idea of being Scottish. 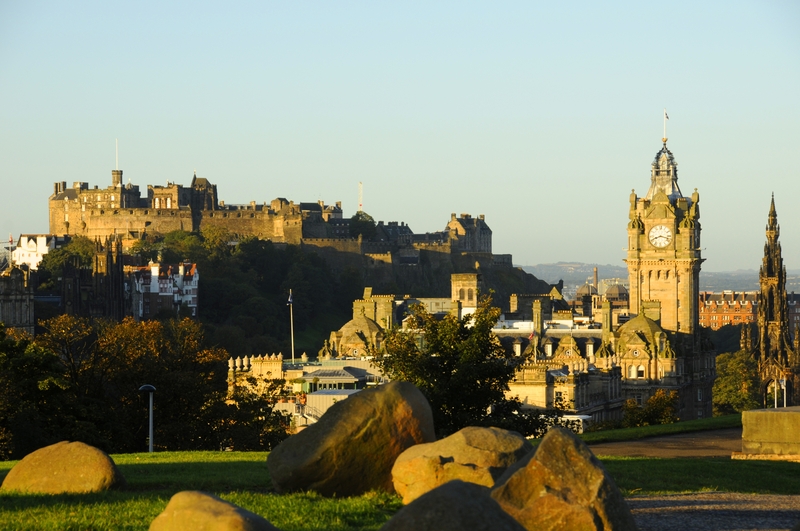 Why was Edinburgh called 'Auld Reekie'? Before I give you the unflattering explanation, I'd better stress 'was called'. Also, how shall I explain 'Auld Reekie' for non-native English speakers? My dreadful French / franglais offers "ancienne avec odeur affreux". In the middle ages, the French were at times liked in Scotland for not being English. (When we were not invading England, we were complaining loudly about the - fewer - times the English invaded us.) Our arrogance forbade us to admit that we actually admired the French (or anyone foreign), but a few dialect words betray that some French customs earned a grudging respect. The old Scots dialect word for a decent-sized cup is a tassie (une tasse), a well-made plate was an ashet (une assiette), etc. These French words pronounced in a Scottish accent show that we adopted some French customs - and reveal just how far civilisation had (not) advanced in my native land at the time. Another French phrase was adopted when visiting Frenchmen complained bitterly about the Edinburgh custom of throwing the night soil into the street with no warning, sometimes hitting luckless or unwary passersby. (You will now perceive whence came the "odeur affreux".) Embarrassed Scots hostesses assured their French guests the custom would be changed - in future the night soil would be flung out with a warning. They told their servants to cry, "Gardez vous", on these occasions. The servants, ignorant of French, corrupted this to 'Gardeyloo' which in Scots dialect makes a sort of sense. It remained the cry used until (slowly) advancing civic standards made it no longer needed. The fact that when the visiting Frenchmen complained, there was apparently no Scottish phrase already in use needs no comment! Scotland, England, Britain, the UK, l'Albion Perfide - which is it? After one of my foreign colleagues emailed round that the next ESUG would be in 'Edinburgh, England', I thought it might be prudent to link to this lighthearted look at British political geography. This makes everything clear - or would if the presenter did not talk so fast that non-native English speakers may need to hit 'pause' at times to keep up! Scotland was originally inhabited by four independent groups. The obscure Picts in the north-east were matrilineal and had a writing system only recently deciphered (they wrote - or at least left - very little; just some engraved stones). The Britons in the south-west are the same people as today's Welsh and Cornish (and Bretons). The Angles (i.e. English - see above) inhabited Edinburgh and the south east. The Scots were raiders from Ireland who settled in the north west. The Latin term Scoti or Scotti means "pirates"; lack of understanding (or of shame) caused the Scots to use the name when referring to themselves in Latin texts. Interaction of the complicated Scots' sister-son inheritance rules with the Pictish matrilineal rules caused a Scot called Kenneth MacAlpin to claim both thrones in the dark ages. He met with "the 7 earls of Alba" at Scone to agree protection of Pictland's separate identity. Nothing is known of the meeting except that it was afterwards referred to as "the treachery of Scone", the 7 earls disappeared from the scanty recods of the time, and the whole area was thereafter called Scotland. The complex inheritance rules continued until the time of Duncan and his son Malcolm, and their rivals Gruoch and her husband Macbeth, when it was finally settled - by the usual Scottish methods (see Shakespeare's play) - that the more common father-to-son-or-daughter inheritance rules would be followed. There is Mons Meg, an ancient cannon. There is the more modern one-o-clock gun. (It should have been the 12 o'clock gun, in imitation of a London Greenwich observatory custom, but - typically - a Scot pointed out that we could save 11 charges of gunpowder by firing it an hour later.) And there are the crown jewels. Some 200 years ago, Sir Walter Scott the novelist (an alumnus of my old school) found himself wondering where the Scottish crown jewels were. They were well-attested in history but he realised he'd never seen them. Enquiries revealed that nobody else had seen them either. Neither the royal family nor the civil service had the faintest idea where they might be. Sir Walter began an Indiana-Jones-style quest that ended with him finding the jewels in an old chest buried under piles of junk, where they had lain, forgotten and unregarded, for a century or so. When the Queen is not wearing them, the jewels are on display in the castle - they will be there during August. If you go to see them, glance in any old chests you pass - you never know, Sir Walter might have missed something. The heart of Scottish Christianity - and also the scene, on occasion, of some not-so-Christian events. :-) There was a time in Scotland when the prudent preacher read the lessen over a pair of loaded pistols, lest the congregation throw the furniture at him - see where Edinburgh character Jenny Geddes thew her well-aimed stool. See the pulpit from which the puritan John Knox banned as many things as a modern safety fascist. See where the heraldic memorials of the noble Marquis of Montrose, and of the Earl of Argyll who executed him and was in turn executed by the king Montrose died for, confront each other. See also fine architecture and monuments. Battle, murder and sudden death - and an Abbey, gardens, fine tapestries and pictures; allow enough time when you visit. (N.B. it's a working palace - if the Queen is there, it may be closed. If you liked the optical illusions we saw in the Barcelona social event, you may enjoy visiting the camera obscura. One of the very many places in Edinburgh at which anyone not too keen on all this culture stuff can instead study the other "spirit of Scotland". What are those columns on the hill at the end of Princes Street? If you look east down Princes Street, you will see several Greek columns on the Calton Hill. Edinburgh's tourist literature identifies the edifice as commemorating Scotland's dead of the napoleonic wars - and tactfully avoids mentioning that it is blatantly unfinished. It was to have been built by public subscription. What you see is all that could be extracted from tight-fisted Scots - hence the local Edinburgh name for it in my day: "Scotland's disgrace". How did this backward capital of a backward country (as you describe it above) become famous? That is a very interesting question - and not quite as irrelevant to the subject of this conference as everything else on this page. The union of Scotland with England was finally completed in 1707. In that year, the Carron ironworks was founded. Its Scottish owners had to pay English engineers good wages to come and work in that backward country Scotland since such skilled labour could not be found locally. It was the same with doctors - people would have looked at you strangely if you'd suggested sending to Scotland for medical advice. And if you'd spoken of Scots philosophy, they might have replied, "Do they have philosophers there?" Within living memory of that date, engineers such as Telford and Stevenson had acquired the fame that lasted into our day, when StarTrek took it for granted that the chief engineer of a starship would be a Scot. Edinburgh had become a leading centre of medicine in the western world. As for Scots philosophers, even Dr Johnson, when not teasing Boswell about his Scottishness, could speak of conversing in Edinburgh with "men who do not need my praise to become famous". What caused this extraordinary transformation is an interesting study for anyone who cares about what obstructs or enables human creativity. My ideas are far too long and serious for this lighthearted page. If interested, buttonhole me at the conference. So you grew up in Edinburgh? Yes. I went to the Royal High School, like Alexander Graham Bell (inventor of the telephone), Sir Walter Scott (novelist) and many others, famous and infamous. The Royal High was founded in 1174. Its charter of rules included a reference to the municipal law code that was intended to be a final catch-all - but which in fact managed to miss a surprising amount. These omissions were fixed one by one as incidents over the centuries revealed loopholes. Thus a growing list of additional rules was created. Every year, this list was read to us - in order of importance, not of date - in a special ceremony that bound us to obey all the extra rules for another year. Having heard this list recited each year over my whole school career, some of the more unusual rules are now engraved on my memory. This was probably the most grave of the many omissions. With a precision that in retrospect can be seen to have been rather unwise, the original code captured very exactly the murderous intent expressed in assaulting members of the town council with broadswords, claymores, dirks, sgain dubhs or bows and arrows, but failed to allow for human inventiveness. So when William Sinclair claimed there was no rule against what he had done, the headmaster reluctantly conceded the point. From the rapidly cooling body of the Bailie of Edinburgh came no objection and his town councellors had found it prudent to depart the scene; it therefore passed nem. con. - and a new rule was hastily added. The school's official version is that the headmaster was being just, if a trifle pedantic. Scottish historians (the cynics) say the headmaster was terrified. William Sinclair's father was Mormaer of Caithness and Baron Roslyn, with enough clan connections to have summoned to his castle of Ravenscraig a force capable of sacking Edinburgh had the judgement been one he disliked. The belief among the pupils in my day was that the headmaster probably felt about Bailie Macmoran and his councillors much as we felt about ours. It was very necessary we be reminded of this rule annually. Because it was of old "the tounis school" (i.e. the Edinburgh town's school), the Royal High was in the bizarre situation of being an old foundation - what in England would be called a public school (i.e. that means a private school to any foreign readers) - that was as directly under the control of the local council as any modern state school. When the local council's politics were not friendly to "elitist" schools, they let us know it. There was even an attempt to abolish the school name during my time - but fortunately this was defeated (the councellors perhaps realising the risk of multiple violations of the rule if it had passed). In my day, it was a general pupil belief that we were still authorised to kill town councillors with atomic weaponry or lasers, but the school science labs were never well-enough equipped to let us put it to the test. The school has had to move several times in its long history. When I started, both preparatory and senior school were of such sturdy Victorian stone construction that it was obvious to us why the rules did not bother to forbid action with pickaxes, nor did the volcanic plug on which Edinburgh rests encourage subterranean mining. We tried to persuade the history department to let us build a mediaeval counterpoise as a project, but instead they had us make a film of the battle of Bannockburn, calculating (correctly) that we could only injure each other doing that. The resulting film (in which yours truly had a starring role) was much more historically accurate than Braveheart and is doubtless gathering dust in some school basement. Before I finished school, the council moved us to a new site (that no-one should waste a second going to see) where it certainly seemed to me that the above rule might be exposed as inadequate - if the shoddy construction did not cause the buildings to deteriorate unassisted. The old school prize-giving hall on the Calton hill, with its painted ceiling and oval tiered seating, was to have become the home of the Scottish parliament but instead the members decided to build themselves something new and modern. The new building went eleven times (!) over budget, which sadly has proved a precedent for all activity initiated within it. There was some feeling in my day about the fact that this rule was only 3rd in importance. First the councillors were protected, then the buildings and only then were we considered. The decline of Latin and Greek learning amongst the pupils made this a nice little earner for the teachers - until its decline amongst them made it hard for them to issue the fines in a learned tongue. The move to a new school, where no-one knew which of the playgrounds was top quad, the introduction of decimal currency in which you could not pay a groat (4 old pennies), and inflation (which made a groat not worth having or paying) made this already-dying rule fall into total desuetude. There were many other rules, some of them written in archaic Scots legal terms (now only found in the longer Oxford English dictionary's word-cemetery), which my English readers, let alone any foreign ones, will not know, and which we mostly did not know at the time. We would have loved to turn the school into a 'fortalice' - but were usually approaching the years of discretion before we knew what that meant. Making a 'bing' was easier - boys do that naturally and the girls were by no means incapable. As for the many 'astrictions' to which we were subject, the teachers enforced them with a thing which in Scotland is called a 'tawse' (now banned in horror by the effete eurocratic 'court of human rights'). On one well-remembered occasion, a teacher wished to punish 6 boys but had left his tawse at home. He sent one of the culprits to our class to borrow our teacher's tawse. Not knowing that 6 were to be punished, and that he had lined them up so blow could follow blow without apparent intermission, we imagined it was to punish just the boy we had seen. The blows were clearly audible through the wall separating the classrooms. 1, 2, 3, 4 - a normal sentence. 5, 6 - a serious crime, evidently. 7. 8, 9 - wow, that pupil has clearly been very bad. 10, 11, 12 - twice the usual maximum! What did he do? 13 !!!!! At this point, our teacher stopped teaching and started listening to what was beginning to sound like Captain Bligh dealing with a particularly rebellious mutineer. 14, 15, 16 - OK, who did he impale on the railings? 17, 18, 19 - he can't have blown up the gym block - we'd have heard. 20, 21, 22 - oh no - he's killed a town councillor! Eventually the 24th stroke was reached and the same boy who borrowed the tawse - and who chanced to be the one at the end of the line, so the most recently punished - was sent to return it, looking rather the worse for wear but to us like the very model of stoicism. The poet says schooldays are the happiest days of your life. Actually, I'm happier writing Smalltalk, but I'll grant that mine were interesting at least. My wife's family liked Gordonston, the more recently 'royal' school of Scotland, whose other famous alumnus is Lara Croft, and the rival Edinburgh school of Fettes boasts such questionable alumni as Tony Blair, but the Royal High had a great advantage over these. Its school song was in Latin - and trust me, when you have to sing about how much you love the old place, it's better to do it in Latin.